[UPDATE, April 12] 16 new spy shots have been added to the gallery, below. You know summer is getting closer when camouflaged prototype vehicles trade the snowy backdrop of Sweden for apexes at the Nürburgring. 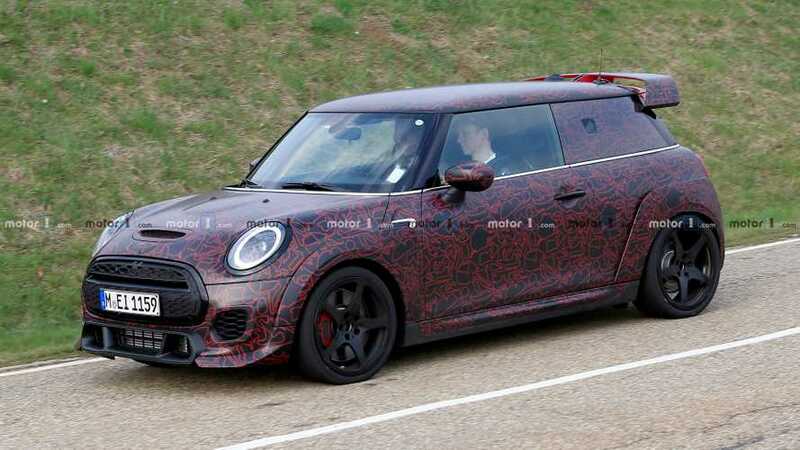 That’s where the current crop of Mini spy photos come from, giving us a pretty good look at the upcoming John Cooper Works GP edition. We’ve seen the limited-edition hot hatchback before, but the “camo wrap” on this test vehicle doesn’t hide very much. We mention that with quotes because this clever covering isn’t made from a random splattering of patterns – the red shapes are actually outlines of various race tracks. How cool is that? 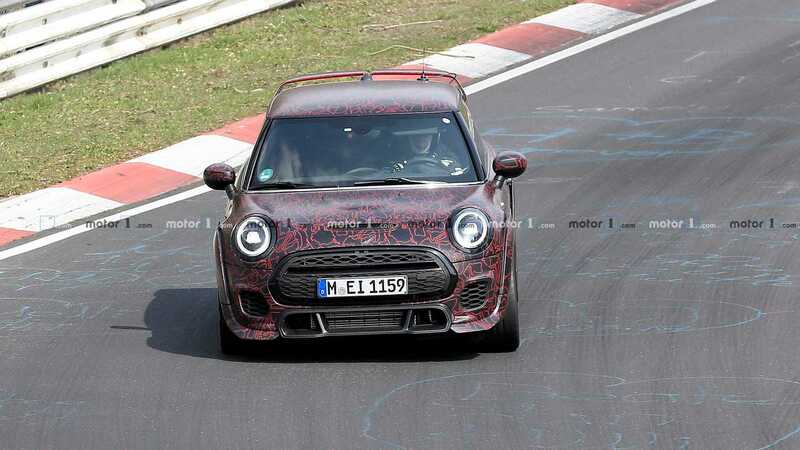 We’ll give Mini engineers some credit on that, because once you realize the wrap is full of race tracks it does draw your attention away from the bits that separate this muscular Mini from the rest. For example, the massive front brakes are barely contained behind the GP’s five-spoke wheels. The body kit is a bit easier to suss out as well, and we don’t think there’s anything short of a full-on tarp that could hide the massive roof spoiler. Of course, all these components have a purpose. Back in February, Mini dropped a teaser for the JCW GP and promised it would be both the fastest and most powerful Mini ever produced by the factory. To make that happen, we suspect it might get a version of the 2.0-liter turbocharged four-cylinder sourced from the BMW X2 M35i, which makes 302 horsepower (225 kilowatts) in stock trim. Getting that power to the ground will be a modified suspension setup designed to bite corners, and the track-oriented model will likely lose some weight in the process as well. Mini will build just 3,000 examples of the John Cooper Works GP edition. Though the camouflage is certainly thinner (and unbelievably cool), a proper reveal is likely still a few months away. We do know, however, that it will enter the market sometime next year.